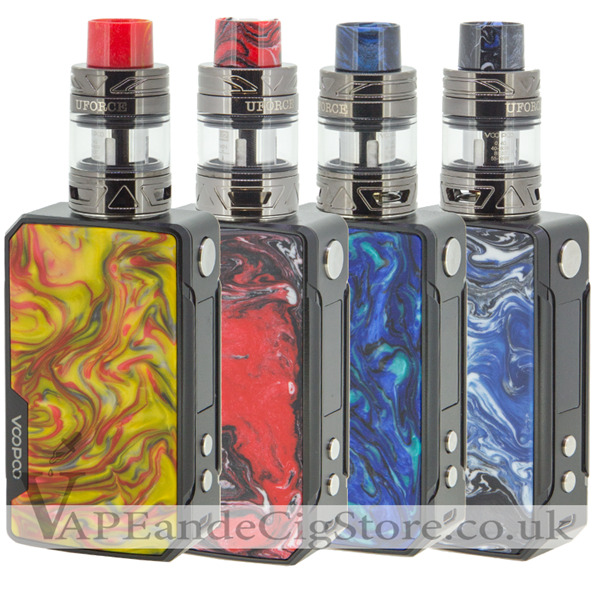 The Voopoo Drag Mini is a small and compact vape kit with a built-in GENE Fit Chip for battery-efficient outputs. With is powerful 4400mah after this starter kit really packs a punch. Constructed by zinc alloy chassis, the mod adopts a visually striking resin inlay design. On the control face, you will see a crystal clear OLED display with a menu that displays the current battery level, mode, resistance or voltage, and wattage. Powered by a built-in battery with the newly updated chipset, it also supports VW/ VPC/TC/TCR/BYPASS mode. As for the included Uforce T2 tank, which features large e-juice capacity with bubble glass tube.